In order to get from an idea to a con­crete project result and for the process to run smoothly, it is nec­es­sary to divide the process into phases. The stan­dard phas­ing described in the Intro­duc­tion to Project Man­age­ment has been cho­sen here as the start­ing point. This stan­dard phas­ing is based on that of Twyn­stra Gudde, a project man­age­ment spe­cialised con­sul­tancy, and has also been applied by other authors in the field of project man­age­ment, such as Grit1. 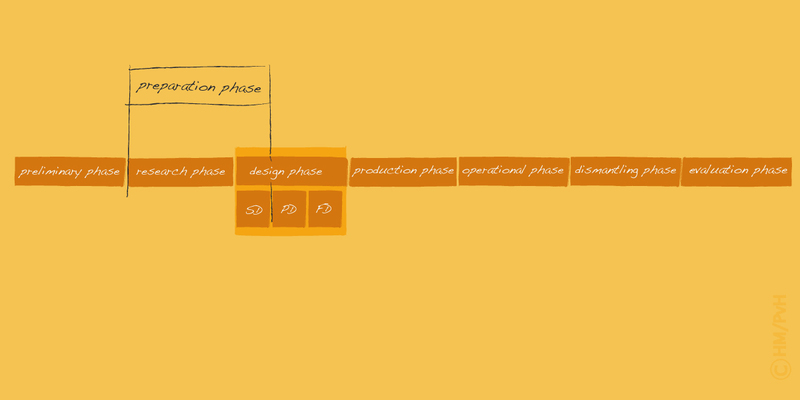 This stan­dard model has been adapted on this web­site to a spe­cial type of projects, that is exhibitions. In recent years, sev­eral mod­els have been pro­posed for the devel­op­ment process of exhi­bi­tions, some of which are based entirely or par­tially on the Project Model Exhi­bi­tions. An exam­ple of the lat­ter is the model that Dirk Hout­graaf and Vanda Vitali pro­moted in the pub­li­ca­tion Mas­ter­ing a Museum Plan2. Since we are focus­ing pri­mar­ily on the devel­op­ment of narrative-led exhi­bi­tions, we are lim­ited to the type of projects within the com­pli­cated domain as defined in Dave Snowden’s Cynefin frame­work. These are projects where the rela­tion­ship between cause and effect must be analysed or those which require some other form of inves­ti­ga­tion or the appli­ca­tion of an expert’s knowl­edge. These are projects based on apply­ing good prac­tice. In fact, the rea­son behind this website. 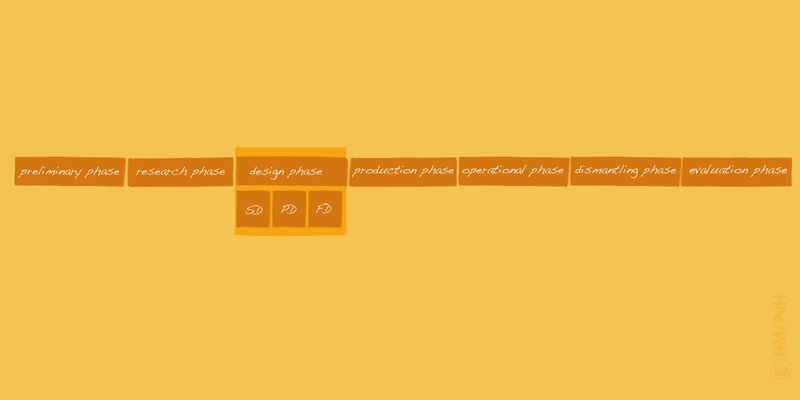 The scheme below shows a dia­gram­matic overview of the phases. These phases are explained in the website. 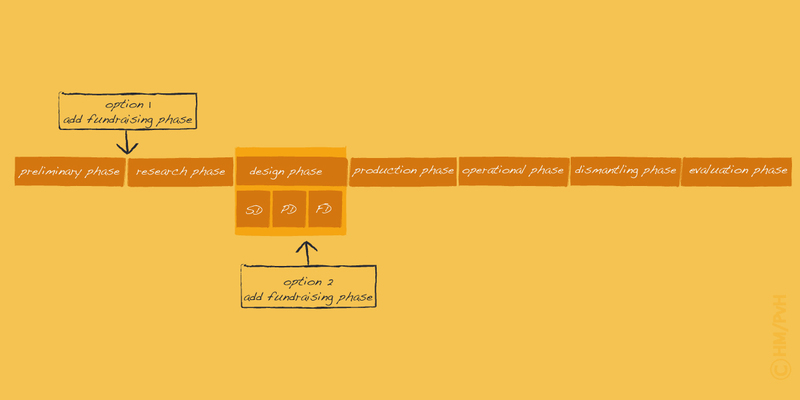 Depend­ing on the nature of each project, phases should be adapted to fit the sit­u­a­tion, thereby allow­ing the project to run smoothly and log­i­cally. Listed below are some com­mon vari­ants on the pro­posed project model for exhibitions. In this vari­ant the Research phase and the Design phase SD are com­bined for rea­sons of effi­ciency. This is par­tic­u­larly rea­son­able if work­ing with a project team where the designer plays a part from the start of the project, which is what is rec­om­mended here. In this way the prepa­ra­tion for the the­matic research can be com­bined with the prepa­ra­tion of the design of the exhi­bi­tion, such as mak­ing good floor plans for the exhi­bi­tion space(s), draw­ing in avail­able facil­i­ties such as elec­tric­ity, cli­ma­to­log­i­cal and alarm sys­tems etc. On the basis of ini­tial results from the the­matic research, the first ideas can then be devel­oped for the design of the exhi­bi­tion (the sketch design). Because all of these activ­i­ties have a prepara­tory char­ac­ter, this, together with the con­tent, is called the Prepa­ra­tion phase. For smaller exhi­bi­tions organ­ised by gal­leries, a large part of the Pro­duc­tion Phase is often omit­ted. The artist hangs or places his works by him­self or together with the gallery owner mak­ing use of the facil­i­ties avail­able at the gallery, such as pan­els, show­cases and light­ing. In this type of exhi­bi­tion there is also often min­i­mal or no men­tion of a design phase. Often choices about how best to place the art­work in the exhi­bi­tion space are made by trial and error on-site. For large projects or projects with a long lead time it may be use­ful or nec­es­sary even to sup­ple­ment the Pre­lim­i­nary Phase with a Def­i­n­i­tion Phase. These two phases are com­bined in the stan­dard model for rea­sons of effi­ciency. Exhi­bi­tion projects are gen­er­ally not so large that a sep­a­rate def­i­n­i­tion phase is necessary. In larger and/or com­pli­cated tech­ni­cal projects it is use­ful or nec­es­sary even — cer­tainly when detailed pro­cure­ment pro­ce­dures have to be fol­lowed — for the tech­ni­cal aspects not to be included in the Final Design (FD). In this case it is bet­ter to make a sep­a­rate design in the form of a Tech­ni­cal Design (TD). In this approach, after com­ple­tion of the Design Phase with the afore­men­tioned TD, a “pro­cure­ment phase” is added to the begin­ning of the Pro­duc­tion Phase. In many projects, fundrais­ing is part of the exhi­bi­tion process. Given the time-consuming and uncer­tain nature of this it is worth adding a sep­a­rate phase for this pur­pose. It is use­ful to do this in one of the fol­low­ing two junc­tures in the exhi­bi­tion process. The first one is between the Pre­lim­i­nary and Research Phase. The fundrais­ing then takes place on the basis of the gen­eral descrip­tion of the project as shown in the result of the first phase, the Pre­lim­i­nary Report. 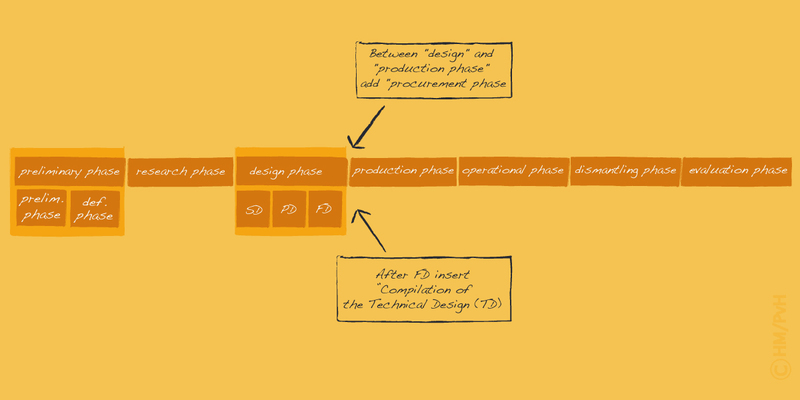 The sec­ond moment is between the phase of com­pos­ing the Pro­vi­sional Design (PD) and the Final Design (FD). When the fundrais­ing takes place here it is based on the much more detailed descrip­tion of the project as shown in the PD. The advan­tage of doing this at the first junc­ture is that only a rel­a­tively small invest­ment has to be made in only the costs of com­pil­ing the Pre­lim­i­nary Report. The dis­ad­van­tage of this approach is that it only gives a very rough pic­ture of the project. In prac­tice, many fund­ing bod­ies or other lenders want to know more details about what the project will look like before they feel able to con­tribute. More­over, many fund­ing bod­ies require that insti­tu­tions them­selves also make a sub­stan­tial invest­ment in the projects under­taken by them. The sec­ond junc­ture over­comes these prob­lems. The PD gives a much more detailed pic­ture of the final prod­uct. It can also be quite well esti­mated. The appli­ca­tion is there­fore more detailed and can be substantiated. There are of course other con­ceiv­able vari­a­tions in-between. For exam­ple, an ini­tial fundrais­ing phase based on the Pre­lim­i­nary Report which focuses on bring­ing together the resources for the con­tent phase and the com­po­si­tion of the SD and PD. Based on what has been estab­lished with these means, PD is then fol­lowed by a sec­ond fundrais­ing cam­paign to bring together finances for the rest of the project. In fact, the first phase involves tak­ing on an invest­ment risk. If the sec­ond fundrais­ing phase fails this invest­ment will not result in an imme­di­ate result. The doc­u­ment in which the cho­sen project phas­ing is deter­mined is the Action Plan. Where nec­es­sary, this is sup­ported by rea­sons why cer­tain stages are added or com­bined. This plan also indi­cates where go and no-go moments are located in rela­tion to the start of the next phase.